2017 has started off with a bang. Change has started whether I like it or not. Today Scott found out he was being laid off. This is very scary. I have to keep remembering that when God gave me the word change, HE also let me know that He has got this. I am thankful, I was off today from work to help my son with a college registration problem. I was home when Scott got the news. We were not expecting this and we are not where we would like to be financially. I was glad that we had time to catch our breath and start to make some plans/ changes in how things would be here in our house. I am thinking back on the verse I have for this year. 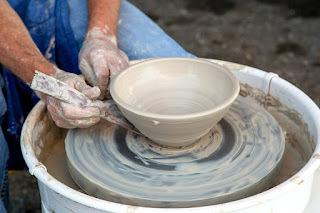 Potters have tools! Sharp tools that cut into the clay. If I am the clay, those tools may inflict a little pain or discomfort. Change can be good, but right now this one is painful. This is really inspirational. I love the fact that you quoted teh verse for us, and I know i am going to be invested in your journey. Thank you so much for sharing a part of your life with us.